FREDDIE: It looks like we’ve been searching for the New Moose in all the wrong places. FRIEDA: Yeah. We need to search for a way to find the moose, not for the Moose itself. Let’s go meta! MOOSE: There’s an island for that! Search Island. NARRATOR: But, meanwhile, on Search Island, the Eaglebot had been in touch with the Pigs and is already waiting for the band of explorers to arrive. 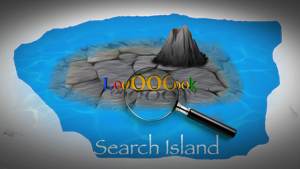 Search island is a barren place, with a huge mountain of data in the middle. At the top of the mountain, the Eaglebot, with mechanical wings and laser eyes, brags about his awesomeness. Trusting my advice and not their eyes. 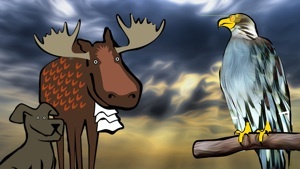 I’ll send ’em on a wild moose chase! When asked to serve my country I said yes! © Copyright 2013-2014 David R. Johnson and Mario Tosto. All Rights Reserved.